Anyone who has ever read Charles Darwin is acutely aware of his fascination with domestication – particularly how he fancied fancy pigeons. Darwin drew on his domestication obsession while writing his book, The Variation of Animals and Plants under Domestication, in which he outlined his ‘provisional hypothesis’ of pangenesis (heredity). In the century and a half since, researchers studying the domestication of plants and animals have continued to advance our knowledge of the genetic mechanisms underlying heredity and selection. Here, I interviewed the authors of two recently published studies that elegantly examined the genetics of tameness and domestication in cats and rats. The road to a kitten-video-dominated world began ~9.5 thousand years ago when cats first showed up in human settlements in Cyprus – thousands of years after the domestication of dogs (though the dog domestication date is hotly debated). This means that, compared to dogs, cats have been subject to artificial selection by humans for a much shorter period of time. It is possible that this explains the relatively low amount of phenotypic variation across domestic cat species (e.g., the difference between a wolf and a Chihuahua is orders of magnitude larger than the difference between a wild cat and a house cat). However, there are still clear behavioral differences between domestic cats and wild cats, which is why I wouldn’t suggest trying to cuddle with a wild cat. So what gives? Are these behavioral (and some morphological) changes reflected in the genome? How do the genetics of cat domestication compare to their counterparts, the dogs? This is where a new study by Michael Montague and colleagues comes in (Montague et al. 2014). “Since cat domestication is relatively recent, and since some populations of wildcats actively interbreed with populations of domesticated cats, we anticipated that the domestic cat genome and the wildcat genome would be very similar,” said Montague. These findings are important because it provides some support for the hypothesized role that neural crest cells might have in mammalian domestication, as predicted by the “domestication syndrome” (Wilkins et al. 2014). selection for docility, as a result of becoming accustomed to humans for food rewards, was most likely the major force that altered the first domesticated cat genomes. Many of us have heard of Dmitry K. Belyaev’s famous fox domestication study. What many of us don’t know is that he began a similar experiment on rats around the same time. Approximately 64 rat generations ago (i.e. since 1972), researchers have been artificially selecting a line of rats for tameness (or aggressiveness) towards humans. Each generation, the 30% most tame rats and 30% most aggressive rats are selected to breed for the next generation. This artificial selection has led to two behaviorally distinct lines of “tame” and “aggressive” rats. To remedy this situation, Albert and colleagues reanalyzed their 2009 data using a newer QTL mapping method that doesn’t assume fixation – Flexible intercross analysis (FIA). This modeling approach quadrupled the number of tameness QTLs detected, from 2 to 8 QTLs. 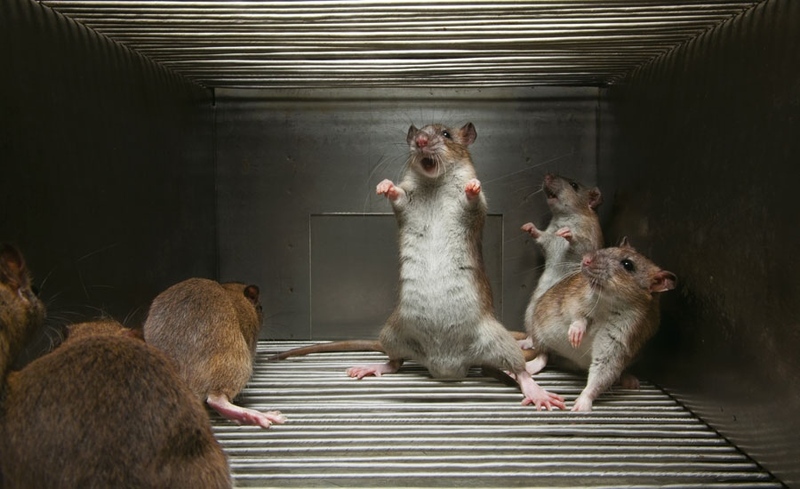 The study also measured gene expression in the brains of 150 of these rats, which allowed them to identify >600 expression QTL (eQTL) associated with tameness. Interestingly, many of these eQTL overlapped with a tameness QTL – in particular the strongest QTL (Tame-1). This suggests that selection for tame and aggressive rats has led to changes in the frequency of variants that influence brain gene expression and, likely, behavior. that tameness in these rats clearly has a highly polygenic basis and that selection appears to have been acting on variants throughout the genome. to publish the genome-wide scans for selection that we have been performing. We want to see if the genes that we find under selection in these artificially selected lines of rats, mink and foxes are similar to the results coming out from genomic analyses of other domesticated species. If the answer is yes, it will be another level of validation that these selection experiments are a useful model for studying the process of domestication. A long term goal is to demostrate that the genes we identify contribute to behavior, and to ultimately understand the biology behind this. Taken together, these studies highlight that the impact of domestication on the genome is not straightforward, and that complex traits, such as tameness, are not defined by just one gene. Both of these studies primarily focused on regions that contained genes and a much finer resolution mapping approach is needed to pinpoint specific variants underlying domestication and tameness. Given the potential importance of variation in gene regulation in speciation, it is likely that variation in regulatory regions (e.g., enhancers) has been affected by domestication (as well as “rat-taming”). So it looks like there is plenty to look forward to in the realm of cats, rats, and domestication. Montague MJ, Li G, Gandolfi B, Khan R, Aken BL, Searle SMJ, Minx P, Hillier LW, Koboldt DC, Davis BW, Driscoll CA, Barr CS, Blackistone K, Quilez J, Lorente-Galdos B, Marques-Bonet T, Alkan C, Thomas GWC, Hahn MW, Menotti-Raymond M, O’Brien SJ, Wilson RK, Lyons LA, Murphy WJ & Warren WC (2014) Comparative analysis of the domestic cat genome reveals genetic signatures underlying feline biology and domestication. Proc. Natl. Acad. Sci. doi: 10.1073/pnas.1410083111. Heyne HO, Lautenschläger S, Nelson R, Besnier F, Rotival M, Cagan A, Kozhemyakina R, Plyusnina IZ, Trut L, Carlborg O, Petretto E, Kruglyak L, Pääbo S, Schöneberg T & Albert FW (2014) Genetic influences on brain gene expression in rats selected for tameness and aggression. Genetics 198, 1277–90 doi: 10.1534/genetics.114.168948. Wilkins AS, Wrangham RW & Fitch WT (2014) The “Domestication Syndrome” in Mammals: A Unified Explanation Based on Neural Crest Cell Behavior and Genetics. Genetics 197, 795–808. doi: 10.1534/genetics.114.165423. Albert FW, Carlborg O, Plyusnina I, Besnier F, Hedwig D, Lautenschläger S, Lorenz D, McIntosh J, Neumann C, Richter H, Zeising C, Kozhemyakina R, Shchepina O, Kratzsch J, Trut L, Teupser D, Thiery J, Schöneberg T, Andersson L & Pääbo S (2009) Genetic architecture of tameness in a rat model of animal domestication. Genetics 182, 541–54. doi:10.1534/genetics.109.102186. Albert FW, Hodges E, Jensen JD, Besnier F, Xuan Z, Rooks M, Bhattacharjee A, Brizuela L, Good JM, Green RE, Burbano HA, Plyusnina IZ, Trut L, Andersson L, Schöneberg T, Carlborg O, Hannon GJ & Pääbo S (2011) Targeted resequencing of a genomic region influencing tameness and aggression reveals multiple signals of positive selection. Heredity (Edinb). 107, 205–14. doi:10.1038/hdy.2011.4. Rönnegård L, Besnier F & Carlborg O (2009) Modelling dominance in a flexible intercross analysis. BMC Genet. 10, 30. doi:10.1186/1471-2156-10-30. Haley CS & Knott SA (1992) A simple regression method for mapping quantitative trait loci in line crosses using flanking markers. Heredity (Edinb). 69, 315–24. doi:10.1038/hdy.1992.131. This entry was posted in adaptation, association genetics, domestication, genomics, methods, next generation sequencing, phylogenetics, quantitative genetics and tagged cats, domestication, eQTL, QTL, rats, tameness. Bookmark the permalink.